Howard Kaplan is museum writer at Freer|Sackler. This is a question we are often asked, and it makes perfect sense. We’re the Smithsonian’s museums of Asian art—yet we have important holdings of American art from the late 19th century, including the world’s greatest collection of works by James McNeill Whistler, along with works by his compatriots Thomas Wilmer Dewing, Abbott Handerson Thayer, and Dwight William Tryon. In the Freer, you can move from a gallery that features Japanese screens and enter a room that displays Whistler’s poetic Nocturnes, while the Sackler currently features a landmark exhibition of Whistler’s works alongside its many galleries of Asian art. How can that be? For the answer, I have to take you back to 1890, when Detroit businessman Charles Lang Freer paid an unannounced call to Whistler’s London studio. The two men became friends and over the next thirteen years, Whistler helped Freer amass what the artist called “a fine collection of Whistlers! 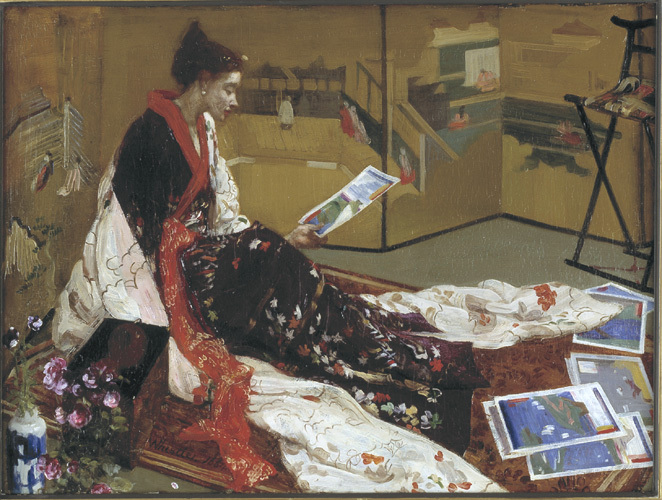 !—perhaps The collection.” When Freer observed similarities between Whistler’s art and Japanese prints, the artist encouraged him to visit Asia, where, he explained, Freer would find artistic treasures—early chapters in what Whistler called “the story of the beautiful“—from which his own work was descended. Freer thus conceived of his museum in large part as a monument to Whistler and the “points of contact” between East and West and ancient and modern that he believed the artist’s work embodied. Freer ultimately would collect more than one thousand works by Whistler, including Harmony in Blue and Gold: The Peacock Room, an opulent dining room painted by Whistler in 1876–77, and others displayed in the Sackler exhibition An American in London: Whistler and the Thames. By 1906, Freer also had amassed a considerable amount of paintings and ceramics from Japan and China and artifacts from the ancient Near East, selections of which can now be viewed near the Peacock Room in the Freer Gallery of Art. Learn more about American art in our collections and An American in London, on view through August 17. You can also explore the Peacock Room in our free iPad and iPhone app. On Thursday, July 17, the Peacock Room shutters will be open from 12–5:30 pm. Come experience this extraordinary room in a new light!